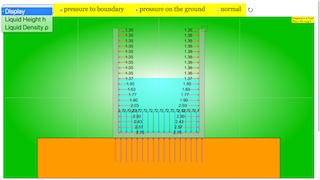 \(P(h)=P_0+\rho g h\) where \(p_o\) is the atmosphere pressure, \(h\) is the depth measured from the surface of the liquid. You can drag the control point to change the shape of the container, and watch how pressure change with depth. While Liquid Height and Density give sliders.